So today's post is exciting because it marks the introduction of a new series, called The Well Dressed Guide. These posts are going to share my must haves for a perfectly well dressed life! 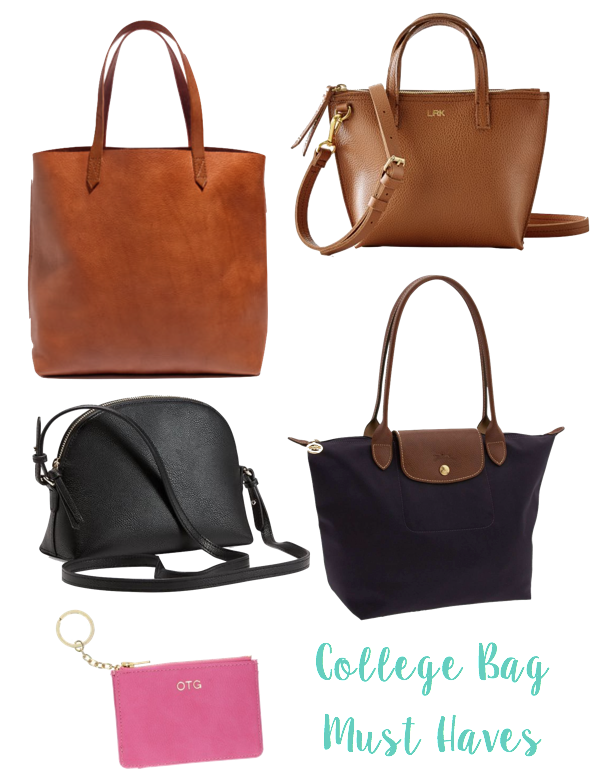 I'm starting off today's post with a guide to all the bags you need in college, because we all know how important it is to have a good bag to tote all of your stuff across campus, and while backpacks are functional they aren't perfect for every occasion. Tote Bag: Perfect for heading to the library for a few hours or heading over to hang out in a friends room. It can fit all of the essentials, plus a laptop and a sweatshirt. When you need to bring all the things, this is the bag you need. Great for those days when you have things to get done but still want to look cute. Crossbody(Camel // Black): You need a good crossbody in college, something that can fit your wallet, keys, and a few other essentials. Perfect for heading out shopping or to dinner with friends. I've found myself toting my crossbody for so many different occasions. Card Holder: I actually don't own one of these but it's number one on my to-buy list. This is perfect for running places on campus, perfect for holding your student ID and your credit card. Plus you can put your keys on the key ring so you never lose any of the essentials. Throw it in your backpack or just bring it along when running to lunch! Longchamp: For those days when you need something bigger than a crossbody but not as big as a tote, the Longchamp bag is perfect. Plus for those days when it's pouring rain, you don't have to worry about it getting ruined like a leather bag. Plus what's more classic than a Longchamp bag? Obviously, you don't need all of these bags to survive college, but they are the bags that I find myself using the most and would recommend. It's definitely nice to have a range of bags to meet different needs.